Manipal Convocation 2010 – Video of the President’s Speech! 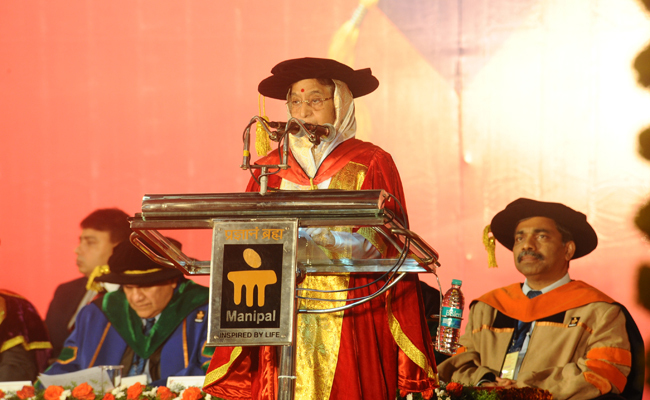 The full text of the President’s speech at the 10th Convocation of the Manipal University can be accessed on the President of India’s official web site here – SPEECH BY HER EXCELLENCY THE PRESIDENT OF INDIA SHRIMATI PRATIBHA DEVISINGH PATIL AT THE CONVOCATION OF MANIPAL UNIVERSITY. I wish the University of Manipal a bright and prosperous future. India with a large youth population has a unique demographic advantage in terms of manpower availability for building the nation. The energy of the youth and their enthusiasm must be guided into productive work. Their ideas and innovations tapped for the betterment of society. I would like to emphasize three aspects which are very important for the overall development of the youth. Education is about knowledge. Whatever subjects you choose you must study them well and in-depth. Merely learning for passing exams is not enough, you should comprehend the various topics through a critical and analytical process. Knowledge without values is incomplete. It is a value system that can prepare the younger generation to become responsible citizens who contribute to the welfare of the society, and to the advancement of the human race. Values provide an anchor in life as well as the ability to take decisions, however difficult. They make you strong and capable of withstanding the trials and tribulations of life. Concepts of peace, harmony and tolerance must be learned here. Build a spirit of working together constructively. In this, sports play an important part. Apart from physical fitness, sports develop qualities like team spirit, discipline and learning to accept success and defeat. Universities must have an environment conducive for the healthy growth of the students, so that their talents can blossom and they become positive individuals. To maintain a leadership role in the knowledge economy, we must focus on innovation and on remaining competitive. We can look forward to achieving double digit growth rates. The number of bridges, roads, harbours, as well as our power generation capacity and transport facilities, among others, require extensive additions. This means that the nation needs a large corps of well-trained engineers and technologists. Unfortunately, there has been a decline in our research capacity. Teaching basic science with practical applications to change the landscape of our villages and towns should be looked at seriously by our education system. I have also emphasized that the activities of good universities must strive to contribute to the richness of the cultural, literary and social aspects of their immediate community. It is in this context, that Universities must have outreach programmes that enable students to interact with local communities and understand their issues. Those who are educated must work for the upliftment of the disadvantaged sections of society as a part of their social responsibility. Practices like ragging and harassing should find no place in educational institutions. I earnestly appeal to students and educational institutions to stop this most disrespectful practice. Drugs debilitate life and when students take to drugs they are drawn away from academic and intellectual pursuits, often disturbing campus life. There should be a campaign to make students aware of the ill effects of drug consumption. You should always remember that success is based on dedication and perseverance. The speech was very well received by the student community as it was very short and inspiring. However, there are aspects in the speech which can be perceived as a pointed attack on the rising drug abuse in the campus, however much the University authorities may deny it.